Sometimes you make mistakes, and sometimes those mistakes need to be corrected. There are a few ways to do this, and a few brands of correction fluids to buy. 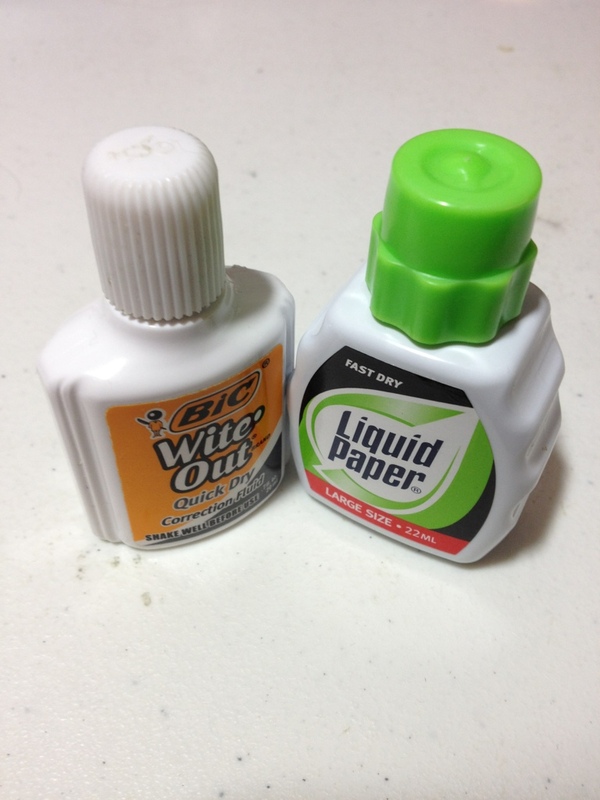 Today we’ll be comparing Liquid Paper and Wite Out. What do they have in common? They both have similar size bottles (~20ml) and a stick with a sponge-wedge applicator. They are about the same size in application. Those are the only cosmetic similarities. The bottles themselves are very different. The Liquid Paper one is a bit larger with grooves on the side for grippyness, while Wite Out is just in a slim, standard-looking bottle. The Liquid Paper bottle has ridges on the cap that are supposed to make it easy to open, but instead they are slippery and difficult. They also get in the way when applying. The ridges on the Wite Out are much easier and less intrusive. But now on to the substance itself. And there is no noticeable difference in the application process, as they have about the same viscosity and go on smooth. The brush on the liquid paper feels a bit stiffer. When dry the best I can say is Wite Out is a warm white, and Liquid Paper is a cool white. The are both undeniably white, but neither are true white. You couldn’t say they have tints, they are just warm and cool. After drying the Wite Out is easier to write on, so that is the only other consideration. It really depends on what paper you have when using these, warm or cool paper. Yellowish will prefer warm. And though Wite Out is easier afterwards, it isn’t too much easier. So it comes down to price if neither of those things matter, as I can say that they both work quite well at what they’re designed for. This entry was posted in Beginner Supplies and tagged correction fluid, fluid, liquid paper, paper, review, white, white out, wite out by Dragon Co (Austin Smith). Bookmark the permalink.